London, UK, 4 October 2018 – A gloomier world economic outlook and rising trade tensions have forced Drewry to downgrade its forecast for container demand over the next five years, according to the global shipping consultancy’s latest edition of the Container Forecaster. “The anticipated re-balancing of the container market looks to have been postponed. That’s more bad news for carriers that are facing substantial cost increases as a result of stricter ship fuel standards from 2020,” said Simon Heaney, senior manager, container research at Drewry and editor of the Container Forecaster. It has been a topsy-turvy year in the container market with demand growth oscillating on a quarterly basis, from the highs of the first quarter to the lows of the second. Growth returned with a vengeance in the third quarter, but no-one can tell at this stage how much it was artificially stimulated by fears surrounding the latest round of tariffs issued by the US and China, or how hard the come down will be in the fourth quarter without the expedited cargoes. 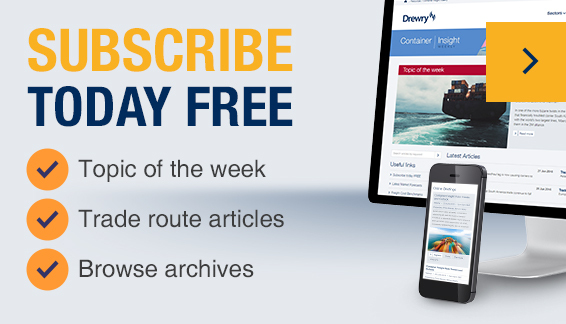 Drewry rough impact assessment of the latest round of US tariffs imposed last month indicate that eastbound Transpacific flows could be hit with an opportunity cost of approximately 1 million teu next year.